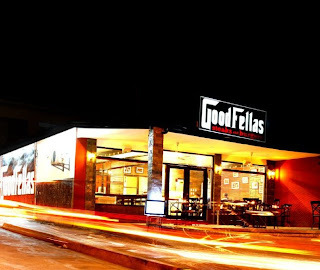 We were recently invited to savor lavish steaks and dishes from Goodfellas Steaks and Burgers. Now let's stop the talking and start eating and dining like what they did during the Mafia days. I love their ice tea in lemon and raspberry flavor. The Gambino Family (Shrimp Salpicao) P 375 - was very enticing to eat, It had a pinch of spice because of the pepper, but they were very fresh and really tasty. Goodfellas House steak P 325, this looks great and succulent, very meaty and juicy 10 oz. of yummy Angus beef, It is one of their best sellers. This is one of my favorites. Pork chop served 2 ways, 1 grilled to perfection, 1 breaded to crispiness. The grilled pork chop was so good, I've forgetten I had the breaded one as well. The breaded chop was crispy out and juicy on the inside, you will never go wrong with this.....CRAVE FOR MORE. Aside from the wonderful dishes Goodfellas has to offer, they have a great selection of wines to taste and complement your sumptuous meal. Great wines tastes great when having it with your steaks. I am not a wine drinker nor an expert in this field so my opinions are purely my own. We were given 3 kinds of wines to sip, and I do appreciate having taste tests and tickling my taste buds to new horizons. Shown below is the Sunrise Merlot, I guess most of us (all the food bloggers present) would all agree that we all loved this. It has a sweeter aftertaste compared to the other two, and thus would definitely suit the Philippine market. Yummy!! Thanks for the pose. Loved the feeling that is as if I was in a movie set of "The Godfather". This place really feels like home and actually, this place was a residential house before it was transformed into Goodfellas Steaks and Burgers. They have formally opened their doors last Sept. 11, 2010 and is a favorite hang out of many celebrities that have heard of their delicious steaks. Please do visit their Facebook Page for promos and other offers. #56 T. Gener cor K-1st St.